Colin has been fascinated with Archaeology and Anthropology since he was 5 years old. He got his start picking up arrow heads and pottery shards from a creek bed on his grandparents farm and has been hooked ever since. Colin has been Flintknapping (the process used to make flaked stone tools) since he was 13 years old. He’d be super excited to answer any questions about Flintknapping or Paleoanthropology you can come up with. 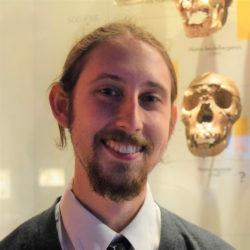 Before coming to HMNS Colin had the opportunity to work at the South Dakota Archaeology Laboratory at Augustana University as well as visit two of the Paleolithic painted caves of France during his Undergraduate. He’s most at home in the Hall of the Americas but can often be found giving tours in the Egypt Hall.